The signing of Henrikh Mkhitaryan back in the summer was no doubt welcomed by Manchester United fans as following his stellar season with Borrusia Dortmund, scoring 20 goals and assisting 24, the arrival of the Armenian playmaker no doubt brought a buzz of excitement to Old Trafford as fans couldn’t wait to see him in action. The start of the season did however throw shades parallel to the performances of Di Maria, as Mkhitaryan seemingly struggled to adapt to the pace of the Premier League and was hauled off at half time during his first ever League start in the Manchester derby. How has his season fared? First of all when you assess Mkhitaryan’s statistics this season it is evident that his best performances have occurred in Europe where has scored 5 goals in 9 starts, one more goal than he has managed in his 14 League starts. It seems as though the playmaker has certainly flourished in these more open style games, particularly when United line up in a more attacking sense. United’s European oppositions this season have predominantly operated less defensively than those in the League and thus Mkhitaryan has benefited from the space in behind the opposition’s midfield, in which he loves to drive forward into with the ball. However when you compare these stats to his Premier League ones, there is an evident decline. In his 22 games (14 starts) Mkhitaryan has scored four goals but managed just one assist as barring a couple of occasions, we haven’t seen this explosive style of play that we know he possesses. Instead, the Armenian has however failed to showcase this talent as defenders have predominantly offered as rather stubborn opposition for him to beat. One may question whether Mkhitaryan’s style of play is suited for the fast pace of the Premier League or if United are utilising him in the correct manner. At Borrusia Dortmund, Mkhitaryan no doubt thrived playing in a more dynamic side where he was able to switch and intertwine with the other forwards. In United’s rigid structure however, this prevents space for Mkhitaryan to move into as without a runner from deep, the opposition is able to stay in a compact shape and have players to cover space in behind their own lines. If United are to get the best out of Mkhitaryan, perhaps a change in formation is required. Are we reluctant to give him stick? Despite slightly faltering in the League this season, it seems as though that United fans are however a little reluctant to criticise his performances. Perhaps of late a few groans and moans have occurred at his appearances, but nothing in the manner that other players such as Fellaini and Lingard receive. One may certainly account this to being that of course it is his first season in England and thus he must be given time to adapt to our style of play. However, when you compare him to other new signings in the League who have a similar style of play and have also managed to adapt more quickly, such as the likes of Leroy Sane and perhaps even Martial, you must wonder why we as fans are resistant to single the Armenian out. Perhaps it predominantly stems from the fact that we are desperate for him to perform and also find it a little hard to admit when our big money signings aren’t cutting it. Regardless of these reasons, it is evident that Mkhitaryan is not hitting the high expectations we fans have of him. 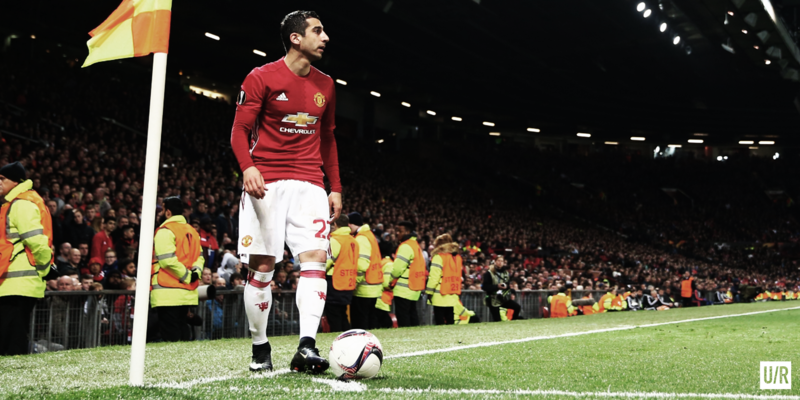 Whilst it has relatively been a rather start stop campaign for Mkhitaryan this season, he has still managed to show glimpses of his undeniable quality. Although his top performances have occurred in the Europa League, we may have to remain patient at the moment to see the best out of him in the League. As we know of the quality that Mkhitaryan possesses, I am sure Mourinho and fans can remain patient and give him a little more time to adapt to get used to the pace and style of the Premier League. In what has been a learning campaign for the playmaker so far, perhaps if we are in the same position this time next year, we can begin asking serious questions about him.